ANAHEIM, Calif. — The way Jon Lester started out, it looked as though he would get deep into the game. He only lasted six innings because of a high pitch count, and had to sweat it out before Jonathan Papelbon saved another one for him. Lester scattered four hits without allowing a run, and the Boston Red Sox overcame some shaky relief by Matt Albers and Bobby Jenks to beat the Los Angeles Angels 4-3 on Friday night. The Red Sox improved to 8-5 following a season-opening six-game losing streak, making Manager Terry Francona’s 52nd birthday a happy one. 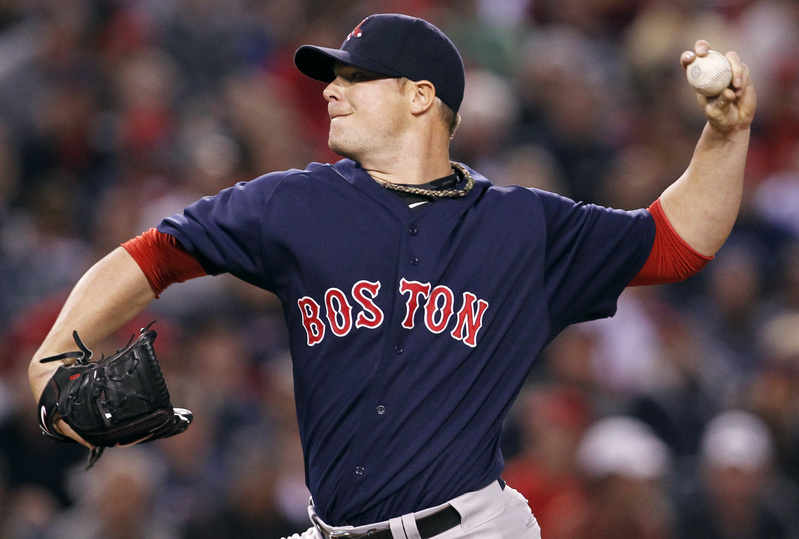 Lester (2-1) struck out eight, walked two and departed with a 4-0 lead after throwing 111 pitches. Boston’s starters have allowed no more than two earned runs in any of the last seven games, with a 1.19 ERA during that stretch. Dan Haren (4-1) allowed four runs, two earned, in six innings. The right-hander struck out six and walked three en route to his first loss in 13 starts since Aug. 20 at Minnesota. Albers, activated from the 15-day disabled list Thursday after missing 11 games with a strained muscle in his back, made his first appearance since April 5 for the Red Sox and gave up an RBI single to Jeff Mathis in the seventh. Jenks surrendered an RBI single in the eighth to Bobby Abreu that ended an 0-for-15 drought. Abreu got to second on a wild pitch and came all the way home on a passed ball by Jarrod Saltalamacchia, but Papelbon pitched a scoreless ninth for his fifth save in as many attempts. Red Sox third baseman Kevin Youkilis, 3 for 16 lifetime against Haren, got the night off after fouling a pitch off his left shin in the first inning of Thursday night’s series opener. Francona said Youkilis would be back in the lineup tonight to face Ervin Santana. Saltalamacchia doubled with one out in the third, as nine-time Gold Glove winner Torii Hunter had trouble making the catch against the wall in right-center. Saltalamacchia advanced to third after Hunter caught Marco Scutaro’s flyball near the right-field line, and Jacoby Ellsbury drove in the game’s first run with a double. Manager Mike Scioscia went to the mound and got into a very animated conversation with Haren before the three-time All-Star struck out Pedroia to end the inning. The Red Sox capitalized on a tough error charged to center fielder Peter Bourjos to score a pair of unearned runs and increase their lead to 3-0. After a two-out walk to Jed Lowrie and a double by J.D. Drew, slumping Carl Crawford followed with a lazy flyball to short right-center. Bourjos, Hunter and second baseman Howie Kendrick all converged on it, but no one took charge, and Bourjos made a last-second lunge at it before the ball hit off his glove. Drew delivered Boston’s fourth run with an RBI single in the sixth. The Angels have lost 11 of the last 12 meetings since sweeping Boston in the 2009 AL division series. Haren had allowed only one unearned run over his previous 22 starts since June 28, 2010, when he pitched for Arizona. … Lester has not allowed a home run in 26 innings over his last four starts, after giving up three in Boston’s season opener at Texas. … Lester increased his career strikeouts total to 742, and needs two more to overtake LHP Lefty Grove for 15th place on the franchise list. The only lefties in Red Sox history with more strikeouts than Grove and Lester are Bruce Hurst (1,043) and Dutch Leonard (771). … This was the second straight start in which Lester had a 1-2-3 inning with three strikeouts, after not doing so in 15 straight outings since July 24, 2010. … DH David Ortiz batted cleanup for the first time this season and was 0 for 4. … The Red Sox are 5-4 on Francona’s birthday since he took the job, including a doubleheader sweep in 2009.